The last word of a song must be the same word that starts the next song. Anyway, maybe this gives you an idea about why I don’t collect. It’s best for me and the world at large if I just avoid that little temptation. 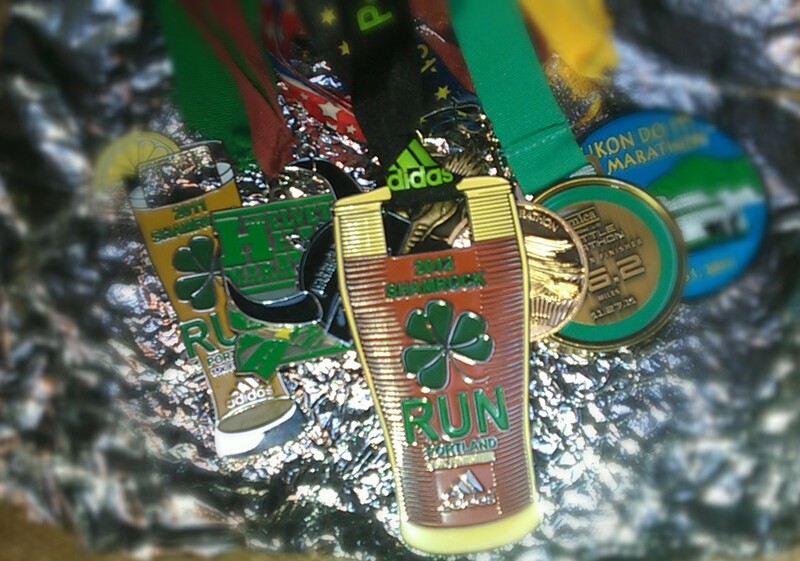 Here’s the one exception to my rule against having collections: I’ve kept every race medal I’ve earned. They’re in a ball of ribbons and Tyvek, tucked away in a corner of a drawer where I don’t see them often but, like Linus’ security blanket, I know they’re there. Every few weeks, I make a deposit. I tell myself it’s an investment in my health, my self-esteem, my attractiveness (such as it is). But really, I just like knowing they’re stacking up in there, weighing the drawer down. It’s a collection difficult to build, thereby requiring it to be limited. About a year ago yesterday I ran my first 15k. There’s no expectation here that anyone else remembered it but it’s one of the stories shared in “Being Smart on Independence Day.” That was the day that, after the race, I returned my parents’ call to wish me a happy birthday and they shared their concerns about my health, weight, and age…and that I was running a 15k at the age of 33. This weekend I ran that same 15k again and between then and now I’ve run a half dozen half-marathons and three fulls. But this time I didn’t have anyone to call afterward. Dad was laid to permanent rest three weeks ago today, emaciated at 92 pounds in a pine and cedar box that was five times his death weight. St. Patrick’s Day is also my grandfather’s birthday, the other love of my mother’s life. My dad’s death plus her dad’s birthday leaves one 68-year-old woman crippled with a broken heart in northwestern Montana. She and I aren’t close but I feel for her. I wouldn’t say my heart is broken but weeks later I still dream and grieve and regret in ways I hadn’t anticipated. After the race, my brother sent me a text message. “Dad’s dog died today and the other dog is missing, assumed dead. Sorry to say via text.” Fortunately, I’d run the hilly race on a banana and two cups of coffee which had long since been burned up, otherwise I probably would’ve sidled up next to the homeless in the waterfront park and been sick there with them. It was St. Patrick’s Day…another woman vomiting wouldn’t have even made a person blink. It’s a grim time. I wasn’t even particularly fond of these dogs but my family has given them a home since I was 16. It’s just one more thing of my Dad’s to go, another little sadness that in and of itself means little but added to the pool of grief is just enough to make the waterfall crest over the edge. I worry about my boys, who loved these dogs and adored my dad. I’m tired. I want a break. I can’t sleep, I can’t read, I can’t write. I know this will pass over, but when? Once home, I peeled the slighty frosty clothes from my extremely chilled body and took a hot shower, wondering how to break this to the kids, whether I should call my mother and check in, when do things get better. Afterward, my sons barge in on me grasping my most recent medal addition from the day’s 15k run (which also, it must be noted, doubles nicely as a bottle opener). “It’s from my run today.” Gathering my towel around me, I pull them to sit with me on the floor. “Hey, boys, I have something important to tell you.” Their faces stilled and they’re prepared. The last time we had this conversation they learned Grandpa died. I don’t feel it right now but watching the boys tells me that eventually it will get better. And I think I’ll keep collecting the medals.